About two years ago, I got a phone call from Joan Teasdale. 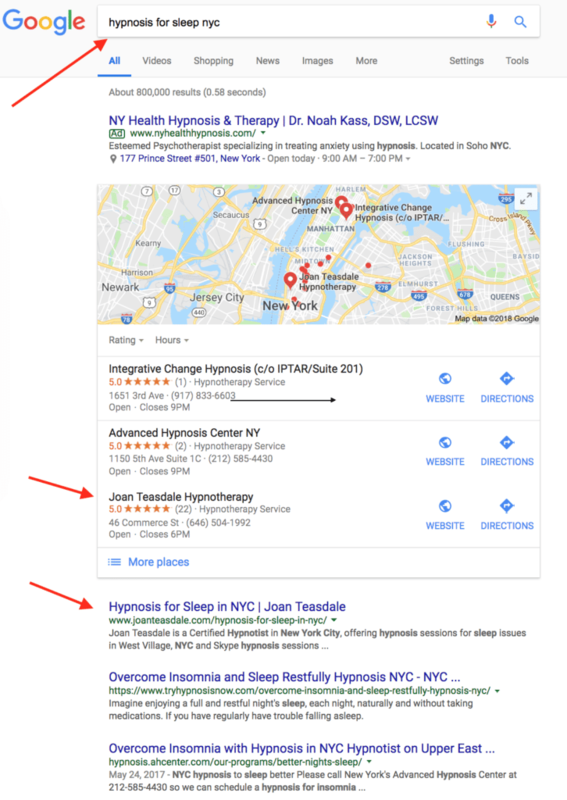 She was a hypnotherapist in New York City who had just started her practice and wanted to rank better on Google. Her website was beautiful but had no SEO – no keywords, no location tags – nothing. Essentially the website was a “brochure” which represented her practice, but it wasn’t informing Google of what service she provided and where she provided it. I told her I’d look into her situation. The best her website could do was page 16. No one is looking at page 16. As you might imagine, Manhattan is full of hypnotherapists and hypnosis centers. The top-ranked website had 26,000 links with optimized pages. Several had been around for many years. I let Joan know what she was up against but she wanted to proceed anyways. We started with Local SEO campaign to get her business listing in all the directories that Google trusts. Those older more powerful websites might not have needed to pay attention to their Local SEO so my guess is that in the long run this would really help her. And then we performed a basic Website SEO campaign to optimize her existing pages for the top keywords. After a few months we saw little ranking movement which was not surprising since time plays a critical role in rankings. Most new websites don’t rank immediately and especially Google listings don’t rank consistently in the top 3 Local Pack right away. And her competition was high. She was getting a few calls, but nothing exciting. Our keyword research suggested some very specific phrases such as “hypnosis for weight loss” and our analysis suggested that creating specialty pages might be the fastest way to get some rankings. If we wrote content (pages) targeting specific niche services that her competition wasn’t doing, and then if she got a couple Google reviews mentioning those niche services, she’d have a chance to rank on page 1! Right? This was the beginning of our monthly arrangement, and a big inspiration for the subscription-based design of Bighorn Local SEO. Each month, we took on the task of writing one new page. We collaborated via Google Docs and she started with writing the content, then I edited to make the content SEO friendly, then optimized the page on her site. The content is about Joan’s clients – it’s not about Joan. **This is a critical thing to note. Sure, these pages might look like they are a bit too much “SEO” on the surface, but the point is this: These pages will be the entry point of the website. These pages will rank well and thus get clicks from people looking for exactly that specialty service. Visitors to websites don’t always come in via the home page and then navigate around like you think they should. No. They enter pages that rank well, then, if they are enrolled in your offering, then poke around a bit and contact you if compelled. If you lived in NYC and were one of the 98% of 7 Million residents that had sleep issues, you might look up “Hypnosis for Sleep issues NYC” and there you’d find Joans page talking about that exact very thing – on page 1 – at the very top. Yes, this worked! Joan is getting calls and emails from prospective new clients daily. Yes – every day! She doesn’t get a TON of calls which is fine, but the inquiries she gets are quality leads since her web pages are very specific and targeted. And those that have a hypnosis session for sleep issues often book a package of sessions do deal with other issues they uncover. With no other form of online marketing or advertising. Yes, new businesses have an uphill battle to rank well. Along the way, Joan did a great job at getting links from her colleagues and community, and along the way she did get more Google reviews, mostly without solicitation. Each month we helped get new links to her website and with those new pages, her site got more traffic. Traffic and visitor behavior is a strong ranking factor, so this helped gradually improve her rankings. This was one of several projects where we witnessed a gradual upwards trend in rankings and clicks and calls that have generated lasting success. Our take-away is that SEO and content strategy is very much like skiing uphill. Keeping that pressure going upwards – by creating signals for Google to discover – content and reviews and links traffic – will show that you are a business that deserves to be ranked well. Eventually, you’ll get to the top of the mountain! And that’s why we’re different. Most agencies might offer an SEO project, only to move on to another project with a different company without ongoing coaching and strategy and research to keep moving the needle. Sure, a one-off SEO project will have an impact, but it seems that in 2018 Google’s intelligence has reached a point where they value fresh active engagement more than before.